Every Lance Friday Home utilizes the utmost available energy efficient products. We provide you with the finest quality and superb energy conservation. The following materials are used as the standard for you new home: Attic Radiant Barrier, R-38 Insulated Ceilings, R-13 Insulated Walls, Hi-energy Low E Windows, 12-2 Copper Wiring, 13 Seer HVAC Unit and Energy Efficient Appliances throughout the kitchen. Our foundation construction exceeds local building codes. Wood Burning Fireplace, Wood Privacy Fence, Landscaping, Marble Vanity Tops in Bathrooms, Upgraded Appliance Packages, Stainless Steel Sinks and Custom Cabinets. Sodded Yard, Front Yard Sprinkler System, Living Room Crown Molding, 2″ Fauxwood Blinds, Whirlpool Tub, Marble Shower, Granite Kitchen Counter Tops and more. 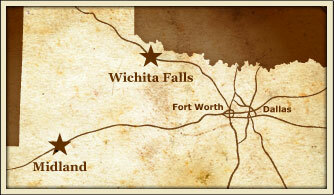 Midland is located midway between Dallas/Fort Worth and El Paso on I20. Midland’s friendly people and central location are the primary reasons for the city’s popularity. The area’s low humidity, combined with warm days and cool nights, contributes to the year round comfort of Midlanders. A combination of factors, including a low crime rate, ample water supplies, quality law enforcement and fire protection, and clean wide streets, results in a sense of security and a high quality of life.